This is an appeal to all my friends and readers and to the world at large. Sadly this post isn’t fiction, but the true story of an amazingly talented young dancer, Bogdan Nicula, whom I had the honor of knowing personally fifteen years ago. We didn’t stay in touch, but a couple of weeks ago I was shocked to learn that he struggles with ALS, the disease against which last year people poured buckets of ice on their heads and which nails Stephen Hawking in his high-tech chair too. But in Bogdan’s case the disease seems to be advancing at a much faster pace than usual. Bogdan now lies on a hospital bed in Düsseldof, Germany, where he used to work as a ballet dancer until December 2014. His family and friends hope to raise the necessary funds for his transport to Thailand for a stem cell transplant, his only chance of survival. His friends and colleagues, ballet dancers from Bucharest, Constanta and Cluj, Romania, organized beautiful charity ballet shows, but until now they could only raise about a quarter of the necessary sum. Bogdan Nicula is a valuable, acknowledged artist in Romania and Germany, he danced on the world’s greatest stages includig the Balshoi Theatre, Moscow. For this reason the Romanian press reported his case, and I took the liberty of translating a chunk from an article that offered the detailed story. The Tragedy of the Romanian Ballet Dancer who paralyzed in full glory. Bogdan Nicula suffers from the same disease as Stephen Hawking. 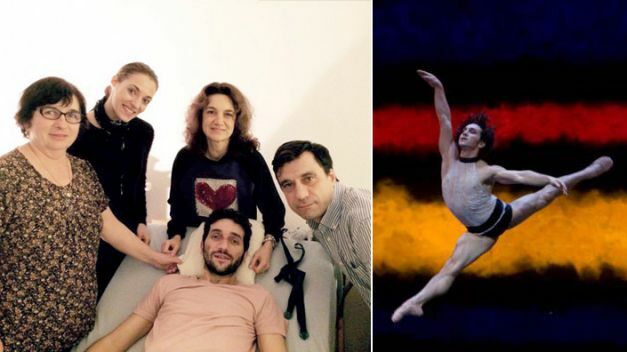 In less than six months Bogdan Nicula (35), a Romanian ballet dancer living and working in Germany, was forced to leave the stage of the Opera House in Düsseldorf for a hospital bed, now almost entirely paralyzed. His family is struggling to raise the money for a stem cell transplant, Bogdan’s only chance of survival. He danced on the world’s greatest stages, from famous German theatres (Mainz and Düsseldorf) to the Balshoi Theatre in Moscow, being one of the most talented Romanian ballet dancers known abroad. But Bogdan Nicula’s career was interrupted this fall, after he was diagnosed to be suffering from a relentless disease, the same one that nails Stephen Hawking – the famous physicist and Nobel Prize winner – to his chair, namely amytrophic lateral sclerosis (ALS). It was to raise funds to find a cure for this disease that last year Hollywood stars poured buckets of ice on their heads in what became a viral movement on the internet (“The Ice Bucket Challenge”). For 25 years Bogdan Nicula worked every day to achieve the best possible muscular coordination, as well as strength, gracefulness and the discipline necessary to attain success as a dancer. He began dancing ballet in the 6th grade, when he moved from a normal school to the School of Coreography in Bucharest, where he managed to catch up the work of two years in only six months. After graduation he worked at the ballet theatre “Oleg Danovski” in Constanta, on the coast of the Black Sea, and in 2001 he started his international career on the stages abroad as a main dancer at Ballet Mainz and later at Ballet am Rhein, Düsseldorf, Germany. His schedule used to start early in the morning with training and it would end late in the evening with ballet shows. But in September 2014 it changed abruptly. Bogdan began to feel drained of energy much faster than usual and increasingly exhausted. He began having difficulty controlling his arms and legs, and getting back pain. Bogdan went to the doctor’s for investigations. The diagnosis came as a shock. In Bogdan’s case the disease avances four times faster than usual. By the end of December he was forced to use a wheel chair and since January he’s lying on a hospital bed, almost entirely paralyzed and barely able to breathe by himself. He only let his family know at the beginning of January, when his state worsened and he found himself unable to fend for himself in any way. “Adevarul” also contacted Monica, his sister, who explained that her brother’s only chance is a stem cell transplant, a procedure that can be successfully performed at the Beike Biotechnology clinic in Thailand. “This disease usually evolves between three and five years, but his case is particularly dangerous. Before Christmas he could still walk and in January he was almost entirely paralyzed. When we came to the hospital in Düsseldorf he was already wearing an oxygen mask. His only chance is a stem cell transplant. We already sent the documents to the clinic in Thailand, and the doctors told us the transplant must be carried out as soon as possible. The problem is that he can’t be transported as a normal passenger, he needs special transportation. The costs for the transport and transplant are very high, around 50.000 Euro,” Monica explained. Dear friends and readers, thank you so much for your help and support for Bogdan during these last months! Further donations won’t be necessary, but all the prayer you can give. Bogdan has passed away on the 21st of June, “tranquil and without regrets.” These were his words. The disease had advanced very quickly – four times faster than in the average case – and left him with solely the command of his eyes in a matter of months. He will always be remembered, loved and cherished. Indeed. I only remember his 21-year-young face, because that is when I last saw him. I even remember the last time we said good bye, on a tram in Constanta, a town on the coast of the Black Sea. I can imagine, images forever imprinted no doubt. It is so awful when a young, talented person like this has to suffer from such a horrid, unfair disease as this. But your blog is a special tribute, that holds his memory alive also. Thank you so much! Your words make me feel my mission was accomplished with this story. I still feel deeply for it. I understand. Well it is true, now I will also think of him sometimes. So. He lives on a little further. Well done to you.